by appointment at our Melbourne and Sydney showrooms. 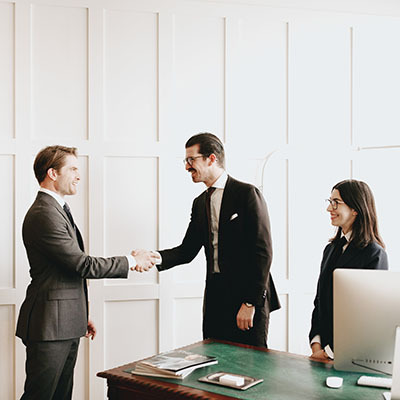 Our made-to-measure tailored suits are built upon a relationship with our clients, designed according to their needs and crafted from the finest fabrics. We present an extensive selection of design options and curate a collection of the most luxurious English and Italian fabrics from established mills. The result is a garment made specifically for you, according to your needs. All the while under our guidance and recommendations to ensure the made-to-measure process is as easy and enjoyable as possible. Our team of fitters and tailors are expertly trained in their crafts to ensure the ideal fit is consistently achieved while building a sartorial wardrobe. Far from the ethos of ready-to-wear designer brands, made-to-measure tailoring adopts a more humble approach and values key considerations including comfort and performance of the garments. We achieve this through the knowledge, skills and experience of our team together with leading made-to-measure construction technology. What this means is a balance between impeccable craftsmanship and precision in the construction of our suits. We’ve seen ‘everyone’. We understand the various shapes and sizes of our clientele – therefore, each made-to-measure tailored commission is individually created to achieve your ideal fit. And because we ourselves believe in made-to-measure tailoring, the collection stage is not the end; but the start of building a sartorial wardrobe. Each suit nurtures a genuine client-tailor relationship that makes for the most functional and meaningful garments.